After introducing the Galaxy Tab 3 range of tablets in April this year, Samsung has now expanded it by adding two new devices to the mix. Both the tablets, called Galaxy Tab 3 8 inch and Galaxy Tab 3 10 inch, are Android devices. Although prices have not been disclosed as of now, these will be available globally some time this month. Here is a look at the specifications of the new tablets. According to the company, the device is designed so that it can be held in just one hand and it comes with a slim bezel so that users can make maximum screen use for e-book reading. The tablet has an 8 inch WXGA TFT touchscreen display (1280Ã—800 pixel resolution) with 189 pixels per inch density and runs on the Android 4.2 (Jelly Bean) operating system with Samsung's TouchWiz user interface. It is powered by a 1.5 GHz dual-core processor, has 1.5 GB of RAM and in terms of internal memory, users will have a choice between 16 and 32 GB models. The internal memory of the device can be further expanded up to 64GB with a microSD card. As for the camera, it has a 5 mega pixel rear camera which can record high definition videos (720p) at 30 frames per second and a 1.3 MP front-facing camera for video calls. On the connectivity front, the device has Bluetooth 4.0, Wi-Fi (with Wi-Fi direct), 3G and 4G and a microSD card slot. The device has a 4,450 mAh battery that should provide decent battery life and comes with GPS (with A-GPS support). In addition to these, the tablet also comes with Group Play- Allows users to enjoy music, photos, documents and games with those around them without requiring a Wi-Fi or cellular signal; S Translator- Provides instant translation, using text or voice translation on applications, including e-mail, text message and ChatON and S Travel- Provides travel assistance and information and can also recommend future trips and provide a guide along the way. The big daddy of the Tab 3 family, this tablet has a 10.1 inch WXGA TFT touchscreen display (1280Ã—800 pixel resolution) with 149 pixels per inch density and runs on the Android 4.2 OS with Samsung's TouchWiz user interface. It is powered by a 1.6 GHz dual-core processor (slightly stronger than the one in the 8 inch version), has 1 GB of RAM and comes with 16 and 32 GB of internal storage, which can also be expanded up to 64GB with a microSD card. Instead of a 5 inch rear camera (like in the 8 inch version), this one has a 3 mega pixel rear camera which can record HD videos (720p) at 30 frames per second and a 1.3 MP front-facing camera for video calls. On the connectivity front, the device has Bluetooth 4.0, Wi-Fi (with Wi-Fi direct), 3G and 4G and a microSD card slot. The device has a 6,800 mAh battery, a requirement for such a large screened device and comes with GPS (with A-GPS support). It measures 243.1 mm x 176.1 mm x 7.95 mm and weighs 510 gm (of the Wi-Fi version. 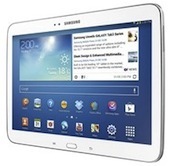 This tablet also comes with a number of Samsung apps and the full suite of Google apps. In addition, this one is equipped with a 'Smart Remote' and TV Out capabilities, the tablet can also be used as a media control device. The new additions means that Samsung now has a Tab 3 device for all categories of tablets, that is 7 (was launched earlier), 8 as well as 10 inch screen size. Considering the company's biggest competitors Apple (with iPad mini and the new iPad) and Google/LG (Nexus 7 and 10 devices) already offer 7 and 10 inch devices, it was only a matter of time before Samsung also updated its own offerings. But we wonder exactly which segment of the user has it targeted with an 8 inch device.